Are you planning a weekend hang-out on a beach? Then you must check out Berenice Beach Club which comprises of separate pool areas and beach areas within its periphery. The club offers other amenities such as showers, restrooms, sunbeds, shaded areas, volleyball- football – baseball pitches, kids clubs, shops, and dining areas along with a bar. In Berenice Beach Club you can also avail different cruises’ experience such as sunset cruise, coral viewing cruise and many more. To confirm your entry in this club, call them for prior booking. How popular is Berenice Beach Club? People normally club together Dolphin Reef and Underwater Observatory Marine Park while planning their visit to Berenice Beach Club. People also prefer to start their day with Berenice Beach Club. Egypt, hosting one of the world’s oldest civilizations is at one side and lands where sorrow is wandering. Watching red sea is good but when I remember this I feel pang. 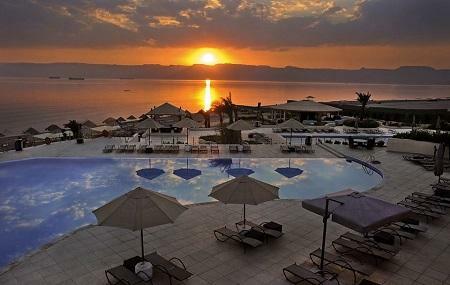 Aqaba is special by its location. In the entrance of the city all the pasaports and IDs are being controlled. The city which was occupied by Britain in the last times of Ottoman State, then was completely lost by Ottomans. Clean, great food, nice staff, great entertaiment. A very nice for beach, sun and sun! Strongly recommended! Good situation . Nice beach for swimming and snorkeling . Beach swimming for shoes an asset. In dire need of an upgrade . Loungers shabby . Shower areas of dubious cleanliness . It was March so maybe not ready for visitors. But still charged. A wonderful new year eve there! in this beautiful beach you can find Lots of umbrellas and shower, family pool, kids pool, couple pool, gym, gift shop, pool bar, diving center, restaurant, bar, disco and the cordiality, courtesy, politeness and friendliness of the staff. Beautiful sea, sand and sky. Must see in Aqaba! Water is amazing. Very clear and warm. As far as good things go, that's it. The beach itself is absolutely nothing special. Good luck with getting in the water bare feet, as there's rocks everywhere. Oh, and we wanted to go for snorkeling which is advertised everywhere and they just told us "no, not today, no boat".